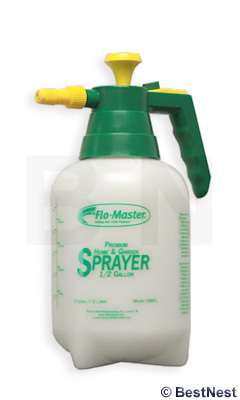 Easily spread liquid product on your houseplants or through your landscaping with the RL Flo-Master Hand Sprayer/Mister. This convenient sprayer evenly distributes fertilizer, pesticide, or liquid plant food to your garden or potted plants in moments. The translucent, plastic vessel accommodates up to 64 ounces of liquid, which remains visible for easy monitoring. Demarcations along the side of the vessel indicate your fluid level in both ounces and milliliters for accuracy. A knob at the top of the lid pumps up and down, pressurizing the tank for an even spray. A handle on the back of the lid makes this mister simple to transport, and a discharge button on this handle activates the nozzle. This discharge can also lock into an ON position, for an even and lasting mist. The adjustable nozzle can spray either a fine mist or a direct stream, to precisely match your needs. The sturdy plastic reservoir holds up to 0.5 gallons of product, and molded legs on the base allow it to rest on a level surface. Care for your garden more effectively with this Hand Sprayer/Mister. Availability: 7 in Stock. Ships from OH within 24 business hours , 7 available at this price!